BioZyme Inc. brand VitaFerm® is now offering its highly bioavailable Concept∙Aid® breeding mineral in a convenient Power Block delivery system. The new Concept∙Aid Power Block combines 20% natural protein with highly available organic copper, zinc, manganese and high levels of Vitamin E for free choice supplementation. The block is specifically formulated to target cycling, embryo production and conception when fed to cattle 30 days prior to calving through breeding. The addition of BioZyme’s proprietary Amaferm® advantage — a natural feed additive that acts as a prebiotic to increase digestibility to maximize the energy value of feed — has also been research-proven to increase energy available to the animal, resulting in more milk production as well as an increased ability to initiate and maintain pregnancy and fertility. The Concept∙Aid Power Block is especially beneficial in Artificial Insemination and embryo transfer breeding programs. 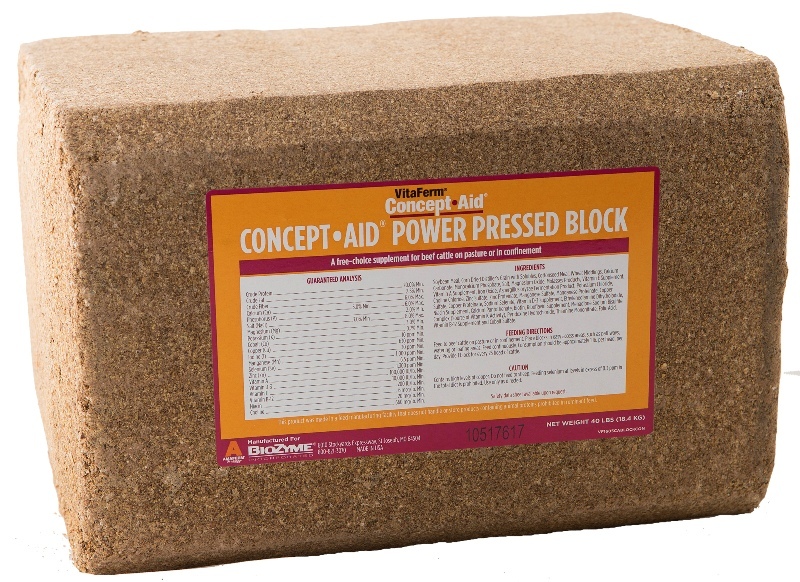 One 40-pound Concept∙Aid Power Block is recommended for 10-20 head of cattle. The rate of consumption is 1 lb. per head, per day. For more information about VitaFerm’s new Concept∙Aid Power Block, visit www.vitaferm.com/products/concept-aid-power-block/.